Tokenise the Future, Be There for the Big Unveil! i-house.com (IHT) is a global real estate blockchain cloud platform and IHT is a smart contract technology utilize blockchain’s intrinsic advantages such as trustless mechanism, anti-tamper, co-supervision, and traceability. Through IHT’s smart contract, large real estate can be split and distributed to financial institutions. In this way, the user will get the opportunity to invest small amounts of money and benefit from real estate and ensures security and low risk of investment. The company now works on expanding its technology for a wider application to other industries. 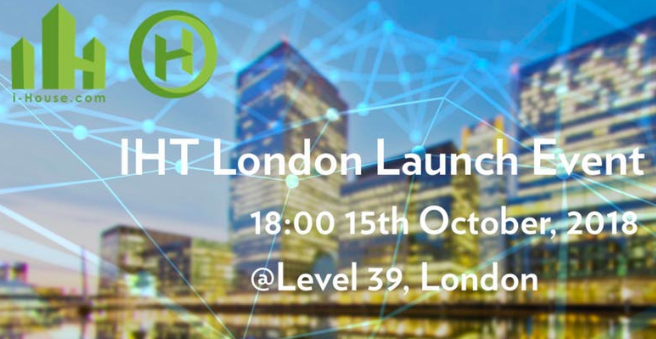 On the 15th of October, the founder and Chairman of IHT Ricky Ng will introduce the IHT’s new technology- ATO2.0，Bitstaq and I-Chain. You will also hear from decisive people from the area of real estate, the blockchain, and finance to discuss the most updated practical application of Blockchain. We are very looking forward to meeting you at the event! i-house.com is a global real estate blockchain cloud platform. Its mission is to integrate global real estate markets with the blockchain mechanism. Through joining blockchain and real estate, the real estate developer, financial institutions and their users can be connected and the transaction of real estate can be made a part of “digital credit society”, therefore constituting a pivotal supporting part of the economic development. All owners and investors will become beneficiaries of i-house.com real estate blockchain. Bitsdaq.io is the world’s leading cryptocurrency exchange platform, which cooperates with Bittrex. Bittrex is the world’s leading blockchain trading platform, founded in 2014, New York, US. Bitsdaq is Bittrex’s official partner in Macau and Canada. I-Chain is Asia’s leading experience & Resource Hub for blockchain and Ai community is to collaboratively solve real-world business problems with blockchain technology and infused by the big data.